John Dean, former Nixon crony, White House lawyer and Watergate co-conspirator, turned on the Republican Party a few years ago. 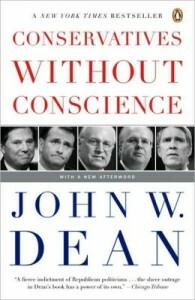 The reason for his turnabout, he writes in his book Conservatives Without Conscience, is that true conservatism has been perverted by politicians and thinkers—primarily the religious right—who embrace an extreme version of authoritarianism, in both philosophy and policy. This authoritarian mentality, as Dean sees it, celebrates obedience, intolerance, and government intrusion into citizens’ choices and personal values. It’s notable when a Republican of Dean’s stature rejects the party’s core principles, and his book is an important addition to the substantial literature on authoritarian thinking. Psychological scientists have been investigating the origins and consequences of authoritarianism for many years, but the mentality remains somewhat of a puzzle. Where does this tendency to submit to authority and social convention come from, and how does it unfold into xenophobia and prejudice? It’s generally been assumed that the authoritarian mentality is learned, and crystallizes in early adulthood along with other political views. But this understanding is now being questioned. Isn’t it possible that authoritarianism is actually pre-political—a psychological tendency that exists independent of social and political expression? Is it possible that individual differences in conformity and similar values emerge much earlier than adulthood, perhaps even in young children? A team of behavioral scientists, led by Michal Reifen Tagar of the University of Minnesota, decided to explore this possibility by actually studying pre-school children and their parents. The scientists had the idea that they could look for signs of nascent authoritarianism in the way kids trust others. It’s known that, while children rely on others for much of their early learning, they are not completely credulous. Indeed, they are quite discriminating in who they consider a reliable source of knowledge, and they rely on cues to help. Specifically, kids are more likely to trust reliably conventional sources, and they are more likely to trust adults. These two cues are quite potent, and in fact may be deeply rooted cues common to most human societies. But here’s the interesting link to authoritarianism. Adults who defer to convention and to those with higher status—these adults are also more authoritarian. So young children who are exposed to authoritarian parents should rely more strongly on these two cues—reliability and status—in deciding who and what to trust. That’s what the scientists tested in a simple study of three- and four-year-old children and their parents. The children all played a trust game, which had two parts. In the first part, they watched film clips of an unfamiliar adult (who they never met in person) labeling common objects—a shoe, for example. In some cases, the adult used all conventional names, while in others they used all unconventional labels—calling a shoe a “ball,” for instance. Still others used some conventional and some unconventional names for the objects. This was meant to characterize the adults as conventional, unconventional or ambiguous in the children’s minds. Then, in the test phase, the children watched new film clips of the same adult introducing novel objects—usually unfamiliar kitchen gadgets—and labeling them with made-up names—a “modi,” for example. Finally, when the videos were done, the children were asked about the labels: “She says that’s a modi. What do you think? Is that a modi?” The scientists were measuring how much the children trusted this unfamiliar adult. Meanwhile, the parents of these children filled out a standard measure of authoritarian predisposition, which had them chose between values: obedience or self-reliance, independence or respect for elders, and so forth. They also completed an assessment of their social conformity. The scientists predicted that children of parents high in authoritarianism would be more sensitive to cues of conventionality—that is, that they would be more trusting of unfamiliar adults who appeared to respect conventions. And that’s just what they found. As reported in an article to appear in the journal Psychological Science, the children of highly authoritarian parents—compared to children of less authoritarian parents—trusted other adults who adhered to social convention. What’s more, when the actions of the adults were ambiguous, these children of authoritarian parents were more apt to trust the unfamiliar adult, simply because he or she was an adult. In other words, they were more reliant on the deep-rooted cue: adult equals reliability. These findings challenge the view that all children develop selective trust as a predictable milestone. It appears instead that there are systematic individual differences in this kind of discriminating trust—and that these differences are directly linked to the parents’ psychological disposition. Children of authoritarian parents are more likely to reject information from non-traditional sources and to accept information from conventional, high-status sources. This inchoate tendency appears to foreshadow the full expression of authoritarianism in adulthood—both the lack of openness to new ideas and the strict reliance on automatic, mindless judgments and decision making.